A par 3 that gives the best of golfers a tough introduction Reay Golf Course. Most players are out with the ‘big dog’ hoping to reach this green. To the right of the tight fairway lies rough ground (the ‘Sahara’) which leads to the 4th tee. To the left, just beyond the clubhouse, is out of bounds and if a player manages to reach the green there is always the possibilty of rolling over the ridge to the right and back of the green. Par is a bonus here, even the current course record started with a bogey. A long, tough par 4 second hole that plays into the prevailing wind. With out of bounds directly to the left for a majority of the hole, this pushes most golfers into the rough to the right or even onto the 3rd fairway. Staying to the centre or left of the fairway is good, as there is a nasty bunker positioned on the right hand side of the green. Once again Par is a bonus, another bogey and your level with the course record. A short par 4 back towards the clubhouse, that normally plays down-wind. This is the chance to get your round off to a good start. The hole is flanked by extensive areas of deep rough to both the left and right. A drive to the right centre of the fairway will set up a good approach to avoid the bunker short-right of the green, but watch out for a stray drive off the 2nd tee as you approach your ball. Named Loch An Eoin after the seasonal small water body situated to the left hand side of the hole approximately 200m from the green, although this only come into play for the twitchy snap-hook off the tee. The green slopes from back to front, keep your ball below the hole to avoid a slippery putt down the hill (and a dreaded three jab!). The first par 5 and the longest hole on the course, a good three shots are needed to reach this green, especially into the prevailing wind. A solid drive is required to carry the 150 yards of ‘Sahara’ in front of the tee and ideally finish to the right of the fairway, but watch out for the rough. The second shot is blind. Aim at the tall hill behind the green to finish on the right hand side of the fairway to set up a good approach. Watch out for the Sanside Burn, out of bounds, at the rear of the green. A short par 3 that is often the scene of a 'Hole-in-One’. A raised tee gives the golfer a good view of the green, but watch out for the pot bunkers left and right that protect the front of the green. Heavy rough and out of bounds are to the left waiting for a stray ball. Braid’s favourite hole on the course. 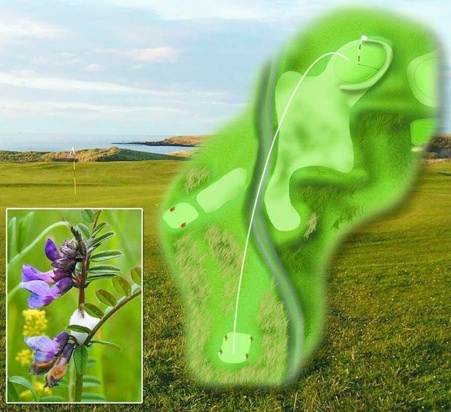 A dog-leg par 5 that’s reachable in two for those who want to take the risk with the Reay Burn surrounding the green. From the raised tee high up in the dunes there are numerous dangers awaiting the unwary. This hole has a reputation for wrecking numerous scorecards and since the walk to the 7th tee is towards the clubhouse, many a medal hunter has walked off the course here! It’s a daunting drive over an expanse of ‘out of bounds’. A good drive to the right of the fairway gives you a tempting view of the green. Too far left and the only option is to lay up. The toughest hole on the course and again can be the downfall of of many. The tee and green are at the same level, but in between lies the Reay Burn and a steep escarpment to negotiate. Take plenty of club here, there are no prizes for being short. A par 4 with out of bounds down the left from the tee. 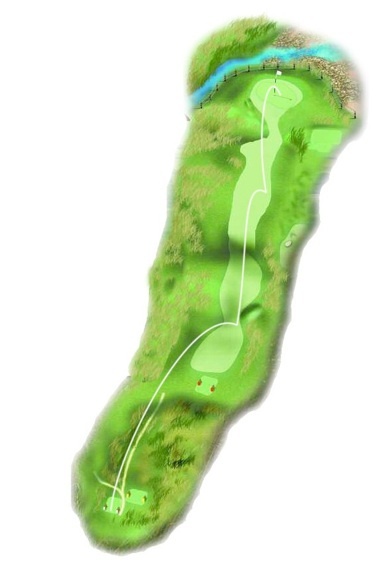 A large hollow at the mid point on the left pushes you to drive for the right of the fairway. The ground banks steeply at the green that punishes anything short. Golfers with good course management skills take the opportunity to check out the pin position on the 11th to the right of the tee. Most forget! On the green, watch out for tee shots carved off the 10th tee! A par 3 to finish the front nine that green looks fairly straight forward. A large grassy bank and out of bounds to the left push most golfers to the right. Varying wind conditions can make this a tricky par. A par 4 with and inclining fairway that leads to a raised green. The second shot can be difficult to judge and hitting this green can be tough in windy conditions. The toughest hole on the back nine. A long, narrow fairway with thick rough to the left and right. The approach to the green is blind and this is when you wish you had looked at the pin position when leaving the 8th tee. The green is protected to the left with a dangerous bunker. A ball landing too short may hit the down slop and shoot through the green. You’re now entering birdie country! The fairway rises to the one of the highest greens on the course. The green is well protected with bunkers, but a carefully placed second shot can set up a good birdie opportunity. Another short par 4 that is reachable for some of the big hitters, but danger lurks off the tee. There’s deep rough to the left and right and a very narrow entrance to the green. Two bunkers protect the front of the green. It’s a good birdie opportunity, but a bogey or worse isn’t unusual. A short par 5 up and over the hill. A wide fairway to hit, but there’s lots of rough for the first 150 yards to catch anything ‘duffed’ off the tee. It’s normally a blind second shot, unless you’ve hit a absolute ‘monster’, and getting the direction right can be tricky. There’s out of bounds left to catch a stray second shot. The green is stepped with a couple of bunkers protecting the right and deep rough at the back. This is supposed to be the easiest hole on the course, but with 3 bunkers surrounding a sloping green, don’t take a par for granted. A ball finishing above the hole can lead to a slippery putt back. Another short par 4 with out of bounds down the left where many a player has donated their ball to the local residents. The out of bounds pushes you to play to the right where Mikey’s Bunker is waiting for you. The six foot face on this bunker will makes for a tricky escape. Some keen players may try and drive the green, the wise will decide to lay up close to the bottom of the hill and attack the fast, slopping green with their second shot. The 17th hole is one of the toughest and the scene of many torn up scorecards. Hitting this fairway is essential but it’s narrow, sloping and has thick rough on both sides. The green is heavily contoured and can leave you with a tricky putt. The course ends as it starts with a par 3. A large two stepped green, risen from the fairway with deep pot bunkers that will catch anything short. Don’t be put off by the rogues watching from the clubhouse as you try to negotiate this green.